Protein powders make great additions to smoothies and shakes, and some people use them as part of a weight-loss program. When mixed with your choice of milk, juice, or even water, they can provide needed nutrients, and may serve as snacks, meal substitutes, and on-the-go energy boosters. But you might find yourself bewildered by the sheer variety of different protein powder brands on the market, especially if you follow the gluten-free diet. Gluten is a protein (it's found in the grains wheat, barley, and rye), and while the majority of protein powders on the market rely on milk-based proteins to provide the bulk of their nutrients, you also sometimes will see products that contain gluten. In addition, protein powders are highly processed, which means they may carry a significant risk for gluten cross-contamination. So what protein powders can you purchase if you have celiac disease or non-celiac gluten sensitivity and need to steer clear of gluten? Fortunately, manufacturers have stepped up to offer numerous choices and a variety of flavors. See below for details on individual products' ingredients and flavors. There are literally hundreds of different protein powders available on the market. The majority include whey, which is made from cow's milk, but many contain soy protein or other vegetable-based proteins. Some also include casein, which is another protein found in cow's milk (and one which some people following the gluten-free diet avoid in addition to gluten). Protein concentrates: As you might have gathered, this is simply concentrated protein. A common protein concentrate used in protein powders is whey protein concentrate--it's common because it's a byproduct of cheese production, and therefore inexpensive. Protein isolates: This is a purer, more highly processed form of protein used for protein powders—it's nearly 100 percent protein. 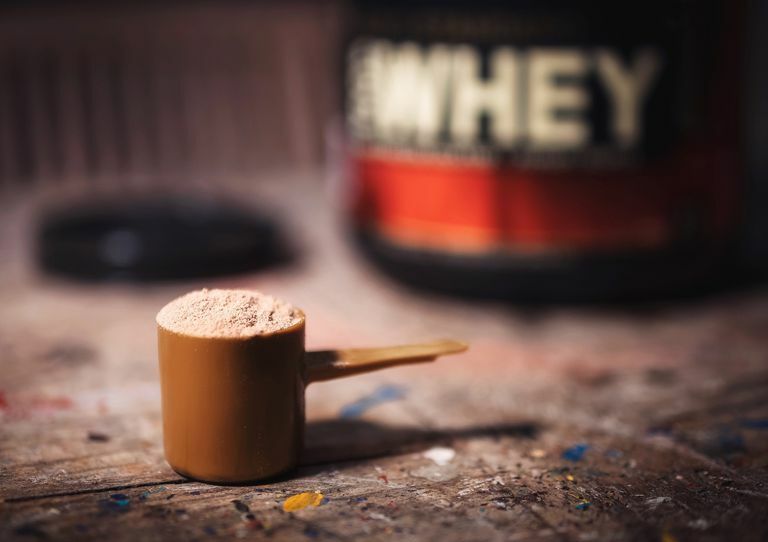 Soy protein isolate and whey protein isolate often are found in protein powders. Protein hydrolysates: Protein hydrolysates are proteins broken down into their component amino acids. They're considered easier to absorb and digest, and athletes use them in an effort to boost performance. Both soy protein hydrolysate and whey protein hydrolysate can be found in protein powder products. There's no "best" protein powder. Some people prefer relatively unprocessed products, such as the unflavored whey protein concentrate powders offered by Cabot and TGS Nutrition. Others want a product with added vitamins and minerals that they can use for a complete meal replacement, and aren't concerned with highly processed ingredients. Still others want something that's free of gluten, dairy, and soy. Body Fortress Super Advanced Whey Protein. Advertised as "zero gluten, zero gimmicks," Body Fortress is made from a blend of whey protein concentrate and whey protein isolate. It also includes what it calls its "super recovery blend" of pure amino acids. The product is available in: vanilla, chocolate, banana creme, chocolate peanut butter, cinnamon swirl, cookes 'n creme (gluten-free), and strawberry. All flavors are considered gluten-free to less than 20 parts per million; look for the "gluten-free" designation on the label right below the ingredients. Body Fortress does contain soy lecithin (which is added to help the protein powder dissolve). Bodylogix Natural Whey. Made from a blend of whey protein concentrate, whey protein isolate, and whey protein hydrolysate, Bodylogix is sweetened with stevia, sourced from grass-fed cows, and contains no artificial colors or flavors. It's considered gluten-free to less than 20 parts per million of gluten, and contains reduced lactose. Flavors include: caramel chocolate chip, decadent chocolate, snickerdoodle, vanilla bean, and natural unflavored. It contains soy lecithin. Cabot Whey Protein. This plain, unflavored protein powder contains just two ingredients: whey protein concentrate and soy lecithin. It doesn't contain added vitamins, minerals or flavors. Cabot Creamery sells whey protein, cheese, and other products made from grass-fed cows. Its products are made in a gluten-free facility. GNC Pro Performance 100% Whey Protein. GNC has a huge variety of protein powders, but only some of them are listed as gluten-free. Look for Pro Performance 100% whey protein (not other Pro Performance products). You can purchase GNC 100% Whey Protein in six flavors: plain, creamy strawberry, chocolate supreme, vanilla cream, banana cream, and cookies & cream. Note that the cookies & cream flavor contains gluten-free cookie crumbs (made from rice flour). The protein powder contains milk and soy ingredients, along with corn starch, sucralose, and other additives. It's considered gluten-free to less than 20 parts per million of gluten. Isopure Natural Flavor. This product includes whey protein isolate and comes in two flavors: chocolate and vanilla. It's sweetened only with cane sugar and Luo Han Guo, a sweet fruit cultivated in China and used as a sugar substitute. Isopure also includes added vitamins and minerals. It's considered gluten-free (to less than 20 parts per million) and lactose-free. Muscle Milk. Muscle Milk comes in powder form, plus the company offers ready-to-drink shakes made with its protein blend. Ingredients include whey protein isolate, casein protein, soluble corn fiber, maltodextrin, plus added vitamins and minerals. The powder comes in a variety of flavors: banana creme, cake batter (gluten-free), chocolate, cookies and creme (gluten-free), graham cracker (gluten-free), natural chocolate, strawberries 'n creme, peanut butter chocolate, strawberry banana, and vanilla creme. Muscle Milk products are considered gluten-free to less than 20 parts per million of gluten. Labrada Lean Body High Protein Meal Replacement Shake. Labrada's shake contains whey protein concentrate and isolate and soy protein isolate, in addition to sunflower oil, corn syrup, MCT oil and added vitamins and minerals. It's considered to be gluten-free (to less than 20 parts per million of gluten), but if you're sensitive to oats along with gluten, note that it includes oat flour (which is added for fiber). The product is available in six flavors: chocolate, chocolate peanut butter, vanilla, strawberry, cinnamon bun, and latte. Orgain Organic Protein Powder. This is a gluten-free, dairy-free, soy-free protein powder made from a blend of pea protein, brown rice protein, chia seeds, and hemp protein. It uses stevia for sweetener and includes sea salt, acacia and guar gums, and natural flavors. Orgain Organic Protein Powder is available in sweet vanilla, creamy chocolate, and peanut butter flavors. It's considered gluten-free to less than 20 parts per million of gluten. PlantFusion Complete Protein Powder. PlantFusion's product is made from pea protein isolate, artichoke protein, organic sprouted amaranth powder and organic sprouted quinoa powder, in addition to fructose (for sweetened versions only), stevia, and guar gum. It's free of gluten, dairy, soy, eggs, nuts, and rice. You can find it in chocolate, chocolate raspberry, cookies & creme (gluten-free), vanilla bean, and natural unflavored. All flavors are considered gluten-free to less than 20 parts per million, according to the company. Quest Protein Powder. These protein powders, made with casein and whey protein isolates, come in nine flavors: plain, cinnamon crunch, cookies & cream, salted caramel, banana cream, chocolate milkshake, vanilla milkshake, peanut butter, and strawberries & cream. All are considered gluten-free to less than 20 parts per million of gluten. The cookies in the cookies & cream flavor and the crunch in the cinnamon crunch flavor both are made from gluten-free ingredients, according to Quest. TGS Nutrition All-Natural 100% Whey Protein Powder. This is another whey protein powder with just two ingredients--whey protein and soy lecithin. It's made from milk from cows never fed recombinant bovine growth hormone (a hormone injected into dairy cows to make them produce more milk). TGS (TGS stands for "The Good Stuff") Nutrition whey protein powder is considered gluten-free to less than 20 parts per million of gluten. Thorne Research MediPro Vegan All-In-One Shake. Thorne Research, a manufacturer of vitamins and other nutritional supplements, intends this powder as an all-in-one nutritional meal replacement. It comes in vanilla and chocolate flavors, and includes pea, chlorella, and chia proteins, plus added vitamins and minerals. It's gluten-free (to less than 20 parts per million), soy-free, dairy-free, GMO-free, and does not contain artificial sweeteners. Thorne Research does not manufacture any products that include gluten. Vega One All-In-One Protein Powder. Vega advertises this as made from "real, whole food ingredients," and those ingredients include: pea protein, pea starch, flaxseed, hemp protein, sacha inchi protein, organic gelatinized maca root, broccoli, kale, spirulina, and green algae. It also contains a blend of vegetables and fruit, such as carrots, beets, cranberries, and blueberries. It comes in eight flavors: chocolate, chocolate almond, French vanilla, mixed berry, mocha, natural, natural unsweetened, and vanilla chai. The powder is gluten-free (to less than 20 parts per million), vegan-certified, soy-free, and dairy-free. It's made in a facility that also processes peanuts, dairy, soy, egg, and tree nuts (but not wheat). Amazing Grass Plant Protein Superfood Powder. This product is advertised as gluten-free, but note that it contains wheat grass and barley grass, which are not gluten-free ingredients. Garden of Life Raw Organic Shake and Meal Replacement. Again, this protein powder is advertised and labeled as gluten-free but contains wheat grass and barley grass. Optimum Nutrition Gold Standard. This very popular protein powder does not contain any gluten ingredients, but does not test for gluten and therefore may be subject to gluten cross-contamination. Note that some protein powders include an ingredient listed as "glutamine." This is not the same thing as gluten. Glutamine is an amino acid, not a protein from wheat, barley, or rye, and all of our bodies contain some glutamine. You don't need to avoid products that include glutamine. In addition, some protein powders include maltodextrin as an ingredient. Maltodextrin is a sweetener, and it can be made from wheat. However, in the United States, maltodextrin most commonly is made from corn, rice, or potatoes, not wheat. In addition, maltodextrin is a highly processed ingredient, and many experts believe it doesn't contain enough gluten to cause people to react, even when it is made from wheat. However, some people react to extremely low levels of gluten—far below the legal limit of less than 20 parts per million—and so if you're particularly sensitive, you may want to steer clear of protein powder products that include maltodextrin, even if they're labeled "gluten-free." Protein powders can serve as the basis for nutritious snacks and meal replacements on the go, and those following the gluten-free diet have plenty of safe alternatives. If you're particularly sensitive to trace gluten, you may want to stick with a relatively unprocessed product with few ingredients, such as Cabot Whey Protein. You also could try Thorne Research's shake product, since Thorne (which is mainly a supplement company) does not use any gluten-containing ingredients in any of its products. In addition, if you're steering clear of dairy along with gluten, you can try one of the gluten-free, dairy-free protein powders, such as Vega One or Orgain. Making a high-protein shake is super-easy: try this recipe for a high-protein shake with berries (if you add fiber, just be sure to use a gluten-free fiber supplement). And as always, be sure to talk with your doctor if you have questions about the right amount of protein you should eat on a daily basis. Manninen AH. Protein Hydrolysates in Sports Nutrition. Nutrition and Metabolism. 2009; 6: 38.